Repin's technique is as fearsome as his musical energy, intelligence, and curiosity. Considering that his musical heritage includes not only the splendid virtuosity of Auer, but the classical perfection of Russian violin virtuoso David Oistrakh, it is no wonder that his performances of the Brahms Concerto are so compelling.
. . . his finest playing on disc to date. His tone has always been sumptuous, but, taking his cue from Henrik Wahlgren¿s serene oboe solo in the adagio, he has never sounded more expressive. This is raptly beautiful playing and the Leipzigers rise to the no less important orchestral parts. In the outer movements, and the Double Concerto, with Truls Mork¿s eloquent cello, Chailly brings symphonic rigour and high drama to Brahms¿s scores. It is hard to think of recent recordings of these great works that match the splendour of sound and musical insight here. Superb. As is immediately apparent from the well-upholstered orchestral sound, with strings well to the fore, and luxuriant phrasing coaxed throughout by Riccardo Chailly . . . Vadim Repin is temperamentally closest to Stern's all-embracing vision, and like Stern's his playing dominates the soundscape . . . Repin's effortless fluency and intonational accuracy are constant sources of pleasure in a work notorious for showing up any rough edges in a player's technique. He employs an unusually wide range of dynamics, gently stealing in during the more lyrical entries, thereby imparting a special sense of give-and-take with the orchestra and a meditative stillness which the white-hot intensity of Stern rarely allows . . . this is undeniably one of the finest versions to have appeared in recent years . . . Repin and Chailly veer towards the warmly affectionate, gently cajoling our senses without unduly ruffling our emotional feathers. Much the same can be said of the Double Concerto, which seduces simply by the sound it makes . . . There is real magic in the air whenever Brahms takes a musical intake of breath, with orchestra and soloists producing a velvety sound of captivating inwardness. Repin and Truls Mørk match their tone to a remarkable degree, negotiating the awkwardness of Brahms's Joachim-edited figurations with a fluidity and jewelled precision that makes exquisite passages . . . I cannot imagine anyone investing in this fine disc being anything less than deeply impressed by its winning combination of beguiling musicianship and phenomenal expertise.
. . . this is a performance on the grandest of scales, full of high drama and extravagant rhetorical gestures. Conducted by Riccardo Chailly, it's also notably slow. The dividends are enormous in the second half: the adagio has great nobility, while the finale is weighty and detailed as well as virtuosic . . . [Double Concerto]: This is a wonderful performance . . . Chailly's conducting has cragginess as well as grandeur, while Repin and Mork are thrilling and tender. Recommended . . .
Brahms¿ Violin Concerto is one of the big, grand romantic violin concertos and deserves to be treated well in the grand manner. This is what it gets here in this new recording by Vadim Repin and the Leipzig Gewandhaus Orchestra under Riccardo Chailly. Repin has a full tone and makes his instrument sing like an operatic star, but his grandeur has nothing worldly or simply ceremonial about it. He plays truly and sincerely. In this respect, he is well partnered by Chailly . . . Vadim Repin is a young musician, but his maturity and assurance is clearly demonstrated here. The Brahms Concerto deserves your full attention and yields great returns. I loved the operatic grandeur and bold sweep of the opening movement and was pleased that few concessions were made to Viennese heart-tugging with the slow movement. Nothing is thrown away in the finale and it all ends at full throttle. There is no sense of rush in this performance . . . Proceedings here are firm, measured and well-paced, but always have a strong sense of moving forward. This is Delphic and Palladian in its majesty and sweep. I speak as a Bathonian when I say this is the Royal Crescent of Brahms¿ Concertos. It is well-matched with a performance of the Double Concerto for Violin and Cello where Repin is partnered by Truls Mork seems less divine and rather more companionable. The slow movement, in particular, shows the true partnership where you have the real sense of the performers listening to one another. Again, this performance has something operatic about it. This is not a contest between two soloists, but truly duet playing. And I wanted to cheer at the end. This is . . . a disc that offers beauty and thought-provoking musicianship in equal measure. And I admire Chailly greatly as a Brahmsian who never loses sight of the essential classicism at the heart of his writing. That said, Chailly also conveys wonderfully well the epic quality of the huge opening tutti . . . Repin relishes the work's moments of delicacy as much as the declamatory ones. Nothing is ever effortful: even the tortuous double-stopping seems to leave him entirely unfazed. The first-movement cadenza, too, is ease personified. The slow movement is one of the highlights of the CD, and it's good to have a credit for the solo oboist, who duets with Repin quite ravishingly . . . what's striking about this reading is how little conflict you sense between soloist and orchestra . . . Repin is such a persuasive artist that it's easy to be seduced by the results . . . The disc is worth hearing for the Violin Concerto alone . . .
His dazzling technique aside, the firm, warm tone, magnificent control of phrasing and rhythmic incisiveness are all tailor-made for the piece. It's an impressively full-blooded reading; the sense of gypsy abandonment that he brings to the finale is most infectious, and Riccardo Chailly's direction of the Gewandhausorchester is with him all the way . . . Repin is joined by Truls Mørk for an equally memorable account of the Double Concerto. They work excellently as a team; the warmth and skill they bring to the Andante, characterising their instruments as the two protagonists of an intimate dialogue, makes this the high-point of the disc. If you want a coupling of these two concertos this is certainly now the version to get . . .
. . . the effect in this performance does create a strong impression of unanimity, and the interaction of the two soloists, not only with each other but also with the orchestral forces-particularly with the wind instruments-makes for some affecting and deeply engaging moments . . .
. . . until I heard this much-anticipated recording, I could not have believed it was possible for the Brahms Violin Concerto to be played with such a combination of consummate technical mastery, interpretive originality, and musically penetrating insight . . . it is in his interpretive approach that Repin makes of Brahms's Concerto something very personal and very special . . . Magnificent and magnanimous as Repin's playing is, the full splendor of this performance is realized in the most integrated and scrupulously managed orchestral contribution I've ever heard in this work; and for that, equal credit must go to Riccardo Chailly and the Gewandhaus Orchestra. Chailly anticipates every one of Repin's nuanced rubatos and expressive phrasings in such a way that soloist and orchestra unerringly coalesce, coincide, and cadence in perfect unanimity . . . Mork reveals, through rubato and expressive phrasing, the many subtleties concealed in the cello's opening recitative . . . Given solo and orchestral playing of such extraordinary excellence, I cannot help but give this release a resounding recommendation.
. . . one of the most beautiful recordings of the Brahms Violin Concerto ever made. First, there is Vadim Repin's tone: flawlessly pure, with a warm glow in the low register, a celestial shimmer in the high one. But what makes it unique is its intense personal expressiveness, proving that there is no such thing as a "beautiful" tone unless it reflects the player's emotional response to the music. In this grand, expansive performance, Repin shows his lifelong love for the work in the way he caresses details, shapes phrases, and gives every note life and significance, even in the running passages . . . Repin and Chailly create a true collaboration of equals, each able to take either a leading or supporting role. The recorded balance, both between them and within the orchestra, is superb, bringing out and interweaving melodic strands in a seamless, colorful tapestry . . . [Double Concerto]: The playing . . . is not less impressive . . . After a majestic, austere beginning, the pervasive mood is expansive, mellow, nostalgic.
. . . one of the most beautiful recordings of the Brahms Violin Concerto ever made. First, there is Vadim Repin's tone: flawlessly pure, with a warm glow in the low register, a celestial shimmer in the high one. But what makes it unique is its intense personal expressiveness, proving that there is no such thing as a "beautiful" tone unless it reflects the player's emotional response to the music. In this grand, expansive performance, Repin shows his lifelong love for the work in the way he caresses details, shapes phrases, and gives every note life and significance, even in the running passages. Refuting the half-serious jest about the concerto being a battle between soloist and orchestra, Repin and Chailly create a true collaboration of equals, each able to take either a leading or supporting role. The recorded balance, both between them and within the orchestra, is superb, bringing out and interweaving melodic strands in a seamless, colorful tapestry. Repin also disproves the assertion that Brahms wrote the concerto against rather than for the violin, tossing off the most formidable technical feats as easily as throwing snowballs . . . [Double Concerto]: [the playing] is no less impressive . . . Intonation and ensemble are impeccable, the give-and-take and cumulative buildups work perfectly. Both players avoid false accents in the tricky finale opening. After a majestic, austere beginning, the pervasive mood is expansive, mellow, nostalgic.
. . . these performances are so great that they have to be mentioned. Repin proves to be an artist with mature insight in the Violin Concerto score. He has a particular feeling of breathing and phrasing which is simply unique . . . He and Truls Mork form a memorable duo . . . Riccardo Chailly makes the Gewandhaus orchestra play transparently and attentively. His sense of balance has matured throughout the years and the result is splendid. Vadim Repins zweiter Streich bei der Deutsche Grammophon bestätigt den Eindruck des ersten -- und übrigens auch den Eindruck, den man sich im Konzert von ihm machen kann: Der Mann ist ein großer Geiger . . . Die Neueinspielung des Violinkonzerts an der Seite des Cellisten Truls Mørk ist frei vom Ehrgeiz aufzufallen, ist bar musikalischen Futterneids, restlos unaufgeblasen. Repin überdehnt oder staucht nicht, stellt nichts von hinten nach vorn oder von vorn an den Rand: Was er macht, ist triftig und angemessen, sein Spiel entwickelt sich ganz natürlich aus der Sache selbst und ist gleichwohl, bei aller Sorgfalt dem Werk gegenüber, alles andere als platt sachlich, vielmehr ausgesprochen persönlich. Die stille Innigkeit des Adagios ist geradezu atemberaubend, nahezu beispiellos, und in dieser Intensität erheblich Repins sinnlich erfahrbarer Authentizität und Glaubwürdigkeit geschuldet. Mit leichter Kraft behauptet er sich gegenüber dem von Chailly beweglich . . . dirigierten Gewandhausorchester, sein fokussierter Ton bewahrt volle Präsenz, auch wenn er sich weit ins Pianissimo zurückfallen lässt oder sich das Tutti breit vor ihn stellt. Die Begegnung mit Truls Mørk beim Doppelkonzert verläuft in bestem Einvernehmen . . . beide [spielen] ausgezeichnet ineinander . . . Chailly und die Leipziger halten tadellos Schritt mit den launischen Eskapaden der beiden Protagonisten . . .
Er spielt und spielt und spielt, stets auf höchstem Niveau . . . Denken wir nur an seinen Beethoven. Etwa die Kreutzer-Sonate, die er mit Martha Argerich, der Göttin des Klaviers, im Konzert gespielt und aufgenommen hat. Da sprühen die Funken, da wackelt die Welt, da strömt die Lava wollüstig aus dem Vulkan, und plötzlich steht alles still. Schnitt. Pause. Aus. Und Arkadien erscheint vor unserem inneren Auge. So in die Extreme getrieben, ist Repins Beethoven; man konnte das schon in der Interpretation des Violinkonzerts mit den Wiener Philharmonikern und Riccardo Muti hören. Ein Parforceritt durch die Seelenlandschaft des Komponisten ist diese Deutung. Repin geht dabei an die Ränder der Musik, an die Ränder des Existenziellen. Das Geschmeidige ist ihm fremd. Obschon: Repins Spiel klingt geschmeidig. Selbst noch im ruppigsten Moment. Ein Poet brüllt nicht . . . bei Repin klingt dieses Brahms-Konzert wie eine Mischung aus den späten Intermezzi für Klavier und der Zweiten Symphonie in D-Dur. Als ein Werk der sinnenden Tiefe und erkennenden Reife, darin die Leidenschaften aber hinter jedem Taktstrich aufscheinen. Und es klingt so wie das, was der legendäre Geiger Bronislav Huberman einst über das Konzert sagte: Es sei dies ein Stück, in dem die Violine gegen das Orchester antrete -- und am Ende gewinne . . .
. . . man [muss] seine Intensität bewundern. Truls Mørk ergänzt Repin im unterschätzten Doppelkonzert kongenial, sehr differenziert dokumentiert von der Tontechnik. 2009 hat erst ein Zwölftel hinter sich. Und doch kann man schwerlich den Gedanken loswerden, mit diesem Brahms-Album eine der schönsten Klassik-CDs des Jahres in Händen zu halten . . . [eine Aufnahme] für die einsame Insel . . .Das Werk ist beim Musizieren neu geboren. In diese Kategorie fällt für mich die eben erschienene Einspielung des Violinkonzertes von Johannes Brahms mit dem Sibirer Vadim Repin und Leipzigs Gewandhausorchester unter Riccardo Chailly . . . [Repin] erfüllt und erfühlt großartig die emotionalen Wechselbäder dieses Werks von pastoralen Stimmungen bis zur ungarischen Attacke. Sein Ton ist warm, aber nicht süß, in den virtuosen Passagen männlich-markant und doch ohne breitbeinigen Draufgänger-Appeal. Doch darf Repin mit Chailly eben auch auf einen äußerst stilbewussten Dirigenten bauen, der das Werk weit über die gebotene Zwiesprache hinaus versteht. Die ästhetische Einheit -- souverän gestützt von noblen Holzbläsern und einem wundergleichen Streicherteppich -- ist das Kapital dieser Aufnahme. Last not least findet sich in gleicher Besetzung plus Truls Mork Brahms' Doppelkonzert für Violine und Cello. Auch hier: Spannung von der ersten Minute. Aber nie Show, nie Effekthascherei. Die ersten Allegro-Takte: Puristisch, suggestiv, fast Bach-Hommage . . . sollte uns vor allem eines empfinden lassen: Glück. State of the art, wie beim Komponisten, sollte es eben sein. Und dies ist dem nahezu Unfehlbaren aus Sibirien nun auch weitgehend gelungen . . . alle betrachteten offenbar ihren Brahms aus dem gleichen Blickwinkel: Harmonie und Virtuosität, eingebettet in eine gemessene, fürs hanseatische Brahms-Feeling passende Strenge, die stets den komplexen Aufbau des Konzertes und seine Spannungsbögen sorgsam herausarbeitet. Repin denkt hörbar sehr genau nach über die Musik -- so wird Brahms in dieser Konstellation eher diskutiert als zelebriert; was der unbändigen Wucht des Konzertes aber gut bekommt. Bei aller Süße und Klangsicherheit von Repins Geigenton gelingt die aufregende Reibung von norddeutscher Spröde und fast schon südländischer Melodienfülle des Konzertes. Die heitere Gelöstheit, die Brahms bei der Komposition in Pörtschach am Wörthersee wohl erfüllte, stellt Repin nicht naiv aus, er denkt sie mit und entwickelt aus diesem Spannungsfeld "seinen" Brahms . . . Repins Aufnahme hat das Zeug zum Klassiker. Schon in seiner Aufnahme des Beethoven-Konzerts hat Vadim Repin gezeigt, dass er sich in die Reihe der "Großen" einfügen kann, und das gelingt ihm jetzt auch mit Brahms. Seine Interpretation . . . besitzt das überlegene musikalische und geigerische Format, das man von einem Künstler erwartet, der zur obersten Solistenkategorie gehört. Repin gestaltet weitsichtig und feinsinnig tonschön in jeder Lage, mit der Wahl der Heifetz-Kadenz im ersten Satz setzt er einen individuellen Akzent. In der Gesamtschau ist Repin auch bei Brahms der moderne Typ des "klassischen" Geigers, der die Tradition seiner berühmten Kollegen auf überzeugende Weise auf höchstem Niveau fortsetzt, mit einer Technik, die über jeden Zweifel erhaben ist, und einem Ausdruck, dem eine stimmige Musikalität innewohnt. Prinzipiell trifft dies alles auch auf die Interpretation des Doppelkonzerts zu. Repin hat mit dem Cellisten Truls Mørk einen hochrangigen Partner an seiner Seite, im kantablen zweiten Satz finden beide wie ein Instrument zusammen. Das Gewandhausorchester Leipzig ist unter der Leitung seines Chefdirigenten Riccardo Chailly ein sehr anpassungsfähiger und klanglich kultivierter Mitgestalter. Schon in seiner Aufnahme des Beethoven-Konzerts hat Vadim Repin gezeigt, dass er sich in die Reihe der "Großen" einfügen kann, und das gelingt ihm jetzt auch mit Brahms. Seine Interpretation . . . besitzt das überlegene musikalische und geigerische Format, das man von einem Geiger erwartet, der zur obersten Solistenkategorie gehört. Repin gestaltet weitsichtig und feinsinnig tonschön in jeder Lage, mit der Wahl der Heifetz-Kadenz im ersten Satz setzt er einen individuellen Akzent. In der Gesamtschau ist Repin auch bei Brahms der moderne Typ des "klassischen" Geigers, der die Tradition seiner berühmten Kollegen auf höchstem Niveau fortsetzt, mit einer Technik, die über jeden Zweifel erhaben ist, und einem Ausdruck, dem eine stimmige Musikalität innewohnt. Prinzipiell trifft dies alles auch auf die Interpretation des Doppelkonzerts zu. Repin hat mit dem Cellisten Truls Mørk einen hochrangigen Partner an seiner Seite, im kantablen zweiten Satz finden beide wie ein Instrument zusammen. Das Gewandhausorchester Leipzig ist unter der Leitung seines Chefdirigenten Riccardo Chailly ein sehr anpassungsfähiger und klanglich kultivierter Mitgestalter. Repin kostet den Brahms'schen Gefühlsreichtum aus, ohne sich zu überschwänglichen Gesten hinreißen zu lassen . . . Repin gestaltet die leisen Passagen leichthändig, sanft, und entfacht im abschließenden Allegro die Glut zum knisternden Feuer. Die Hälfte des Lorbeers gebührt freilich dem Leipziger Gewandhausorchester unter der Leitung von Riccardo Chailly . . . Als zweiter Solist tritt der Norweger Truls Mørk hinzu, der sich mit Repin wunderbar ergänzt . . . Gemeinsam mit den Leipzigern entfalten sie die ganze Dramatik in einem einzigen langen Bogen, der, ganz ohne Frage, die Seele rührt. Tradition, neu gehört: Langsam und fern von solistischem Autismus suchen Repin, Mørk und Chailly nach Leidenschaft, die bleibt. Liebe glüht im Detail. Mit einzigartig schönem und beseeltem Ton erzählt Repin . . . eine Art Geschichte: mal auftrumpfend, mal geheimnisvoll, mal träumerisch seinen Gedanken nachhängend, dann wieder voller Glut und Leidenschaft. Großartig auch das Doppelkonzert mit Truls Mørk am Cello. Riccardo Chailly . . . bringt die Vorzüge der Leipziger Holzbläser . . . dirigiert einen klassisch gerundeten, klangintensiven Brahms. Und er hat einen Ausnahmecellisten zur Verfügung: So schön, so subtil und edel im Klang hört man den Cellopart Im Doppelkonzert selten . . .
Mit dem vorzüglich disponierten Gewandhausorchester Leipzig . . . zeichnet Riccardo Chailly das thematisch-motivische Geschehen mit hoher Transparenz und rhythmischer Prägnanz nach; und mit dem Solisten Vadim Repin weiss er sich in allen artikulatorischen und dynamischen Details so einig, dass der Eindruck einer glücklichen Symbiose entsteht . . . [Repin verfügt] über eine [grosse] tonliche Ausdruckspalette, die er in den lyrisch verinnerlichten Momenten mit ebenso grossem Gewinn ins Spiel bringt wie in den kraftvollen solistischen Aufschwüngen oder in der . . . Solokadenz von Heifetz. Und nicht zuletzt: im Verbund mit dem gleichgesinnten Cellisten Truls Mørk ergänzen Chailly und Repin ihre Aufnahme durch eine wunderbar eloquente und homogene Wiedergabe von Brahms' Doppelkonzert, das hier zu ähnlich eindringlicher Wirkung gelangt wie das ernstere dramatischere Violinkonzert. Vadim Repin est tout simplement . . . "le plus grand violoniste vivant actuellement". Il est facile de souscrire à cette opinion devant la perfection technique et la pure beauté d'un archet déjà entré dans l'histoire de la musique. Repin, c'est aussi une humilité devant la musique et une modestie humaine irrésistible. Autre démenti à toute velléité de se réfugier dans le passé : deux gravures récentes de concertos pour violon marquées du sceau de l'évidence. Vadim Repin enregistre le Concerto de Brahms (DG): non comme une statue de marbre, mais comme une confidence pleine de tendresse et de poésie, où le guarnerius de 1736 nous parle au creux de l'oreille, en parfaite complicité avec le Gewandhaus de Leipzig dirigé ­ par Riccardo Chailly, ainsi qu'avec le violoncelliste Truls Mörk dans le Double concerto. Dès l'introduction, chef et orchestre annoncent la couleur du propos, majestueuse, et déroulent un tapis rouge au soliste. Grâce à une prise de son rapprochée, qui rappelle certains grands enregistrements de l'ère monophonique, son Guarneri des Gesu livre tout la richesse de ses timbres, violon onctueux, capable de sauvagerie comme de la plus grande tendresse. . . . Repin a fait le choix de doigtés qui privilégient les cordes graves, donnant à sa sonorité une chaleur particulière. Fasciné par la tendresse de la partition plus que par sa véhémence, il en propose une lecture centrée sur la poésie du chant et sur la complicité symphonique avec l'orchestre, plus que sur la bravoure instrumentale -- on a rarement entendu dialogue plus fusionnel entre chef et soliste. . . . C'est surtout la voix poignante de Menuhin qu'il nous rappelle dans le second mouvement, par ses élans du c¿ur comme par cette science intime qu'il a de faire parler le violon. Le finale est teinté d'un rhapsodisme fervent mais sans excès démonstratif, gardant en toutes circonstances un ton épique et noble. On retrouve cette hauteur de vue et cette dignité dans le "Double Concerto". Loin de tout rivalité narcissique, les deux solistes discourent avec une admirable cohérence. . . . Ils n'en traduisent . . . la véritable dimension symphonique de la partition, soutenus par un orchestre somptueux. . . . leur duo respire le naturel et la grandeur.
. . . une de plus magnifiques introduction orchestrales de la discographie. L'équilibre des pupitres du vénérable orchestre de Leipzig est mis au service d'un à-propos dynamique hors du commun: la pâte sonore brahmsienne est bien là, envoûtante . . . Une conception de la discipline musicale que Repin partage en tout point: pas un alanguissement, pas un seul abandon gratuit dans cette partition qui les sollicite pourtant, mais des couleurs à revendre et une ligne de conduite sans aucune hésitation. Les sensations procurées dans l'Adagio et le Finale font appel au vocabulaire oenologique: ossature, rondeur et tonicité à ce point liées révèlent ici le grand cru . . . [Double Concerto]: la rigueur, la probité et l'engagement de nos musiciens ont quelque chose d'un autre temps, où l'humilité et la discipline étaient l'hommage que l'on rendait à de tels chefs-d'oeuvre. Repin se singularisait par une approche musicale et une sonorité plus félines, offrant en concert une alternative élégante et poétique au premier . . . le nouveau Repin vient à pic rappeler le merveilleux musicien qu¿il demeure. Il ne pouvait choisir meilleur orchestre que celui du Gewandhaus de Leipzig . . . pour enregistrer sa version de ce monument après l¿avoir rodé une vingtaine de fois en tournée sous la baguette de Riccardo Chailly . . . le chef italien offre au violoniste ce qui sonne comme le plus bel écrin de timbres de la discographie, conciliant majesté symphonique et dialogue chambriste. Encadré de l¿allegro introductif ample et fougueux et de celui conclusif dont Repin et Chailly exaltent, complices, la dimension "giocoso", l¿adagio central est, du point de vue orchestral, exemplaire. Sans minimiser l¿enivrante sonorité du hautbois de Henrik Wahlgren, force est de reconnaître qu¿on entend moins un solo pastoral accompagné qu¿un contrepoint de voix dont l¿équilibre et la respiration, sur ce tempo idéal, confinent au jeu d¿orgue . . . si l¿on y ajoute la souplesse, la vitalité et les mille tendres couleurs du violon de Repin, tout le prix de ce disque. Cet impeccable technicien joue comme un dieu . . . l'attraction des contraires produit l'une des plus belles surprises dans ce répertoire. Ce Brahms est modelé, plastique, pudique, sans aucune lourdeur (grâce à une mise en évidence des sources néobaroques de certains passages) et si . . . tendre. “The Heart Is a Better Brain"
Vadim Repin talks about the Brahms Violin Concerto, tips from Yehudi Menuhin and his personal passion for the “unplayable" work. 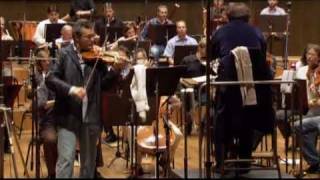 Brahms's Concerto is regarded as one of the most important works for violin - and one of the most difficult. When did you first play the piece? I have a wonderful memory of my initial steps with this concerto. I was eighteen, I'd finished my studies, and there were just the two of us together alone - Johannes Brahms and me. And that was when I met Yehudi Menuhin, and was able to talk at length with him about Brahms's Violin Concerto. I had the good fortune of cultivating a close musical friendship with him in the last seven years of his life - a friendship that continues to influence me today. Yehudi Menuhin is a model for me because I admire his attitude towards the work of an artist. It's fine when someone can play the violin, but for Menuhin that was only the foundation of being a violinist. It was much more important to him how one treated the music and, especially, how one treated people. For him there was no difference. The musician must be a human being to be able to make music. I hope I've done at least some justice to this great ideal. What exactly did Menuhin say to the young student Repin about the Brahms Concerto? We spent a long time discussing individual fingerings and on which strings certain passages are to be played. Menuhin favoured the violin's lower strings. He would move down from the higher strings as soon as he could. I adopted a lot of that - along with his fingerings, which he let me have at the time and which, in part, are still alive in my interpretation today. Is intellectual freedom helpful for such a complex work? I believe you're best off following your heart when you begin working. Naturally you have to look at the context in which the score exists. I played many other pieces by Brahms, especially the sonatas and lots of chamber music, in order to accustom myself to the very particular sound and atmosphere which his music reveals. But this soon turned out to be just the beginning of a lifetime of work. It's a fallacy thinking that a new conservatory graduate can forge such a large and complex piece as the Brahms Violin Concerto into a permanently valid form. I believe fundamentally that good music enables you to grow with it, that it accompanies your own moods and the stages of your life. Could you explain that? How does a work change along with your life? It's already hard enough to play five notes on the violin. The important thought is, therefore, to make audible in those five notes exactly that which perhaps cannot be expressed in words: what do these notes mean to me personally; what feelings do I have for them; which of my current moods do they capture; which images do they allow me to associate with them? Playing the violin is less a question of technique than of self-reflection; conversely a meticulous knowledge of the score is vital. And what does your Brahms reflection look like? First of all, it obviously derives from the score. There's no other violin concerto in which the composer uses the word “dolce" so often. For me this is the sweetest, most tender violin concerto imaginable. And when I stand on the platform and play it, I'm constantly struck by its incredible purity. I think it's the purity that especially attracts me to this music. On the other hand, there's Brahms's compositional perfectionism, his endless genius in developing a melody. Every nuance of this work is elevated in a perfectly balanced and unbelievably beautiful architecture. You're waxing lyrical about a work that once had a tough time with violinists - accused of being too difficult, of having too few melodies and too many important passages for other instruments. The criticism was such that Brahms destroyed the sketches for a second violin concerto. But the volume of this criticism doesn't validate it. Take the beginning of the violin part: for me the violin here is quite clearly introducing the main idea of the whole concerto. You have only to recognize it, the gigantic, emotional picture that's being painted here - this fervour. And we mustn't forget that Joseph Joachim was hugely involved in the creation of this concerto . . .
. . . the great violinist to whom Brahms dedicated his Violin Concerto. I think Joachim is still undervalued. He greatly influenced and encouraged Brahms to break existing rules. He wasn't only a wonderful violinist, but also a thoroughly educated musician. I believe we owe it to him that this concerto redefined compositional forms, that it went beyond everything that came before it. What impresses me most, however, is the creativity contained in this music, which is so logical and unassailable. The whole Violin Concerto is for me a great, wondrously beautiful stone, which in no place ever threatens to crumble - it is in this sense a tenderly monumental composition. Yet it was long held to be unplayable. Were you ever afraid of coming to grief with a piece of music? Well, Tchaikovsky's Piano Concerto was also once considered unplayable - those are words that don't mean much to me. Of course one must have due respect for the composition, but I can't say that these pieces make me afraid. They're simply too beautiful for that, and the lifelong work that one can invest in them is too rewarding. To answer your question: No, I don't have fear, rather the opposite - incredible curiosity to come to terms with the work. Brahms's Violin Concerto is now a classic of the violin repertoire. Your recording has to compete with a lot of others. It strikes me that it distinguishes itself from many recordings through its unbelievable naturalness. You seem in your interpretation to renounce every trace of intellectualism . . .
Perhaps that's because very often the heart is a better brain! This brilliant score doesn't call for as much complicated interpretation as is sometimes assumed - it speaks largely for itself. The naturalness of performance is for me the highest form of intellectualism. The “dolce" markings are a keynote for the whole work - just listen to the dialogues with the orchestra and you can hear the poetry, the speech, the yearning and the nostalgia unfolding. Brahms's composition communicates on many levels, in many layers - you make it all sound very compact. I'm glad you're saying that. In fact the conductor Riccardo Chailly and I came to understand during the rehearsals that one must not present this concerto as a showpiece for violin. You have no other choice than to interpret it symphonically. There are these wonderful dialogues and duets, glorious interplay between solo violin and orchestra, but also between the other individual instruments. On this new album you also play the Double Concerto . . .
. . . to which the same principle applies: musical interaction. Just as the conductor and orchestra in the Violin Concerto are crucial to one's own interpretation, in the Double Concerto it's the solo partner. In Truls Mørk I've found a soul brother. I think we both had the feeling in rehearsals and in the concerts that our ideas and views were perfectly matched in Brahms's music. Herr Repin, Brahms' Violinkonzert gilt als eines der wichtigsten Werke für Geige - und als eines der schwierigsten. Wann haben Sie das Stück das erste Mal gespielt? Ich habe eine wunderschöne Erinnerung an meine ersten Schritte mit diesem Violinkonzert. Ich war 18 Jahre alt, hatte mein Studium beendet und nun waren wir beide miteinander allein: Johannes Brahms und ich. Damals bin ich Yehudi Menuhin begegnet und konnte mich ausführlich mit ihm über Brahms' Violinkonzert unterhalten. Was hat er Ihnen beigebracht? Ich hatte ja das Glück, dass wir in den letzten sieben Jahren seines Lebens eine sehr enge musikalische Verbindung pflegten. Eine Freundschaft, die mich bis heute prägt. Yehudi Menuhin ist für mich ein Vorbild, weil ich seine Einstellung zur Arbeit des Künstlers bewundere. Wissen Sie, es ist ja schön und gut, wenn jemand Geige spielen kann. Aber das war für Menuhin nur die Grundlage eines Geigers. Viel wichtiger war ihm, wie man die Musik und vor allem wie man die Menschen behandelt. Da gab es für ihn keinen Unterschied. Der Musiker musste Mensch sein, um Musik machen zu können. Ich hoffe, dass ich diesem großen Ideal wenigstens zum Teil gerecht werde. Was hat Menuhin dem jungen Studenten Repin denn konkret zum Brahms-Konzert gesagt? Wir haben lange über einzelne Fingersätze diskutiert und darüber, auf welchen Saiten welche Passagen zu spielen sind. Menuhin hat ja die tiefen Saiten auf der Geige bevorzugt. Sobald er konnte, wechselte er von den hohen Saiten nach unten. Ich habe mir davon sehr viel abgeschaut - und seine Fingersätze, die er damals mit mir geteilt hat, leben in meiner heutigen Interpretation zum Teil noch immer. Hilft eine geistige Freiheit für solch ein kompliziertes Stück? Ich glaube, dass man am besten damit fährt, wenn man am Anfang der Arbeit zunächst einmal seinem Herzen folgt. Natürlich muss man sich auch den Rahmen anschauen, in dem die Partitur steht. Ich habe damals viele andere Werke von Brahms gespielt, besonders seine Sonaten und eine Menge Kammermusik, um mich an den sehr speziellen Klang und die Atmosphäre, die seine Musik umgibt, zu gewöhnen. Aber all diese Arbeit hat sich ziemlich schnell als Anfang eines Lebenswerkes herausgestellt. Es ist ein Trugschluss, dass man ein so großes und komplexes Stück wie Brahms' Violinkonzert als junger Konservatoriums-Absolvent gleich in eine ewig gültige Form gießen kann. Ich glaube grundsätzlich, dass gute Musik sich dadurch auszeichnet, dass sie einem erlaubt, mit ihr zu wachsen, dass sie die eigenen Stimmungen und Lebensphasen begleitet. Können Sie das erklären? Wie verändert sich ein Werk mit dem eigenen Leben? Es ist schon ziemlich schwierig, fünf Noten auf der Geige zu spielen. Das Wichtige ist, in diesen fünf Noten genau das hörbar zu machen, was man in Worten vielleicht gar nicht ausdrücken kann: Worum geht es mir persönlich in diesen Noten, mit was für einem Gefühl stehe ich ihnen gegenüber, welche meiner gegenwärtigen Stimmungen fangen sie auf, welche Bilder lassen sie mich assoziieren? Das Geigen ist weniger eine Frage der Technik als eine Frage über die Reflexion mit sich selbst. Umgekehrt ist eine akkurate Kenntnis der Partitur unerlässlich. Und wie sieht Ihre Reflexion bei Brahms aus? Sie ist erst einmal sehr offensichtlich aus der Partitur hergeleitet: Es gibt kein Geigenkonzert, in dem der Komponist so oft das Wort »Dolce« verwendet hat. Für mich ist dieses Violinkonzert das süßeste, zärtlichste Konzert, das man sich vorstellen kann. Und wenn ich auf der Bühne stehe und es interpretiere, bin ich immer wieder beeindruckt von seiner unglaublichen Reinheit. Ich glaube es ist diese Reinheit, die mir besonders am Herzen liegt in dieser Musik. Auf der einen Seite steht Brahms' kompositorischer Perfektionismus, sein unendliches Genie, eine Melodie zu entwickeln. Jede Nuance dieses Werkes ist in einer perfekten, stimmigen und unglaublich schönen Architektur aufgehoben. Sie schwärmen über ein Werk, das es am Anfang bei Geigern gar nicht leicht hatte: zu schwierig, zu wenige Melodien, zu viele wichtige Passagen für andere Instrumente wurden Brahms vorgeworfen. Die Kritik war so massiv, dass er die Skizzen für ein zweites Geigenkonzert vernichtete. Aber die Lautstärke dieser Kritik macht sie nicht richtiger. Nehmen wir den Anfang des Geigenteils: Für mich stellt die Geige hier ganz klar das Hauptthema des ganzen Konzertes vor. Man muss das nur erkennen, dieses gigantische, emotionale Bild, das da gemalt wird, diese Leidenschaftlichkeit. Und wir dürfen ja nicht vergessen, dass Joseph Joachim massiv an der Entstehung dieses Konzertes beteiligt war . . .
. . . der große Geiger, dem Brahms sein Violinkonzert widmete. Joachims Name ist für mich in der Musikgeschichte bis heute unterbewertet. Er hat Brahms sehr beeinflusst und ermutigt, bestehende Regeln zu brechen. Er war nicht nur ein wunderbarer Geiger, sondern ein umfassend gebildeter Musiker. Ich glaube, es ist auch sein Verdienst, dass dieses Konzert die kompositorischen Formen neu definiert hat, dass es weiter ging als alles, was es vorher gab. Was mich aber am meisten beeindruckt, ist die Kreativität in dieser Musik, die so logisch und unantastbar ist. Das ganze Violinkonzert ist für mich ein großer, wunderschöner Stein, der an keiner Stelle zu zerfallen droht - es ist in diesem Sinne eine zärtlich-monumentale Komposition. Und trotzdem galt es lange als unspielbar. Hatten Sie jemals Angst davor, an einem Musikstück zu scheitern? Ach, Tschaikowskys Klavierkonzert galt seinerzeit auch als unspielbar - das sind so Worte, mit denen ich wenig anfangen kann. Natürlich hat man Respekt gegenüber der Komposition, aber ich kann nicht sagen, dass diese Stücke mir Angst machen. Dafür sind sie einfach zu schön, und dafür ist die lebenslange Arbeit, die man an ihnen haben kann, auch viel zu belohnend. Um Ihre Frage zu beantworten: Nein, Angst habe ich nicht, im Gegenteil eine unglaubliche Neugier, mir das Werk zu erschließen. Inzwischen gehört Brahms' Violinkonzert ja auch zu den Klassikern des Geigen-Repertoires. Ihre Aufnahme muss sich gegen viele andere behaupten. Mir fällt auf, dass sie sich durch eine unglaubliche Natürlichkeit von vielen anderen Einspielungen absetzt. Sie scheinen in Ihrer Interpretation auf jeden Anflug von Intellektualismus zu verzichten . . .
Vielleicht weil das Herz häufig ein besseres Hirn ist. Diese geniale Partitur braucht gar nicht so viel komplizierte Interpretation wie man manchmal annimmt. Sie spricht zum großen Teil für sich selbst. Für mich ist die Natürlichkeit einer Aufführung die reinste Form des Intellektualismus. Die »Dolce«-Einträge legen sich wie ein Hauptgedanke über das Werk - hören Sie nur auf den Dialog mit dem Orchester, und die Poesie, die Sprache, die Sehnsucht und die Nostalgie entfalten sich vor Ihren Ohren. Brahms' Komposition erzählt auf sehr vielen Ebenen, in sehr vielen Schichten - bei Ihnen klingt das alles sehr kompakt. Es freut mich, dass Sie das sagen. Tatsächlich haben der Dirigent Riccardo Chailly und ich bei den Proben sofort festgestellt, dass man dieses Stück nicht als Vorzeigestück für die Geige anlegen darf. Man hat gar keine andere Wahl, als es symphonisch zu interpretieren. Es gibt diese wunderbaren Dialoge und Duos, herrliche Interaktionen zwischen der Sologeige und dem Orchester, aber auch zwischen den einzelnen Instrumenten. Sie spielen auf dem neuen Album auch das Doppelkonzert . . . In dem es ja um dasselbe geht: um die musikalische Interaktion. So wie der Dirigent und das Orchester als Partner im Violinkonzert wichtig für die eigene Interpretation sind, so wichtig ist der Partner beim Doppelkonzert. Ich habe mit Truls Mørk einen Geistesbruder gefunden. Bei den Proben und in den Konzerten hatten wir, glaube ich, beide das Gefühl, dass unsere Gedanken sich in der Musik Brahms' perfekt spiegeln. Vadim Repin parle du Concerto pour violon de Brahms, des conseils de Yehudi Menuhin et de sa passion pour cette oeuvre «injouable». Le Concerto de Brahms est considéré comme l'une des œuvres pour violon les plus importantes - et l'une des plus difficiles. Quand l'avez-vous joué pour la première fois? J'ai un merveilleux souvenir de mes premiers pas avec ce concerto. J'avais dix-huit ans, j'avais fini mes études, et il n'y avait plus que nous deux - seuls Johannes Brahms et moi. Et c'est alors que j'ai rencontré Yehudi Menuhin et que j'ai pu parler longuement avec lui du Concerto pour violon de Brahms. J'ai eu la chance de cultiver une amitié musicale très étroite avec lui dans les sept dernières années de sa vie - une amitié qui continue de m'influencer aujourd'hui. Yehudi Menuhin est un modèle pour moi, parce que j'admire son attitude face au travail d'un artiste. C'est bien quand on sait jouer du violon, mais pour Menuhin ce n'était que la base de ce qu'il faut pour être violoniste. Ce qui était beaucoup plus important pour lui était la manière dont on traitait la musique, et, surtout, dont on traitait les gens. Pour lui, il n'y avait pas de différence. Le musicien doit être un être humain pour faire de la musique. J'espère avoir rendu au moins un peu justice à ce grand idéal. Qu'a dit exactement Menuhin au jeune étudiant Repin à propos du Concerto de Brahms? Nous avons passé beaucoup de temps à discuter des doigtés individuels et des cordes sur lesquelles certains passages doivent se jouer. Menuhin aimait les cordes graves du violon. Il les employait de préférence aux cordes aiguës dès que possible. J'ai adopté beaucoup de tout cela - avec ses doigtés, qu'il a bien voulu me communiquer à l'époque et qui, pour une part, sont encore vivants dans mon interprétation actuelle. La liberté intellectuelle est-elle utile pour une œuvre aussi complexe? Je crois qu'il vaut mieux suivre son cœur quand on commence à travailler. Bien entendu, il faut regarder le contexte dans lequel se situe la partition. J'ai joué beaucoup d'autres œuvres de Brahms, surtout les sonates et beaucoup de musique de chambre, pour m'habituer à la sonorité et à l'atmosphère très particulières de sa musique. Mais cela s'est bientôt révélé n'être que le début d'une vie entière de travail. C'est une erreur de penser qu'un violoniste frais émoulu du conservatoire peut forger une œuvre aussi vaste et aussi complexe que le Concerto pour violon de Brahms en une forme valide à jamais. Je crois fondamentalement que la bonne musique nous permet de croître avec elle, et qu'elle accompagne les humeurs et les étapes de notre vie. Pourriez-vous expliquer cela? Comment une œuvre change-t-elle avec votre vie? Il est déjà assez difficile de jouer cinq notes au violon. L'idée importante est donc de rendre audible dans ces cinq notes exactement ce qui ne peut être exprimé en mots: que signifient ces notes pour moi personnellement? quel sentiment ai-je pour elles? lesquels de mes états d'esprit actuels traduisent-elles? quelles images puis-je leur associer? Jouer du violon est moins une question de technique que de réflexion sur soi; inversement, il est essentiel d'avoir une connaissance méticuleuse de la partition. Et à quoi ressemble votre réflexion dans le cas de Brahms? Tout d'abord, elle émane à l'évidence de la partition. Il n'y a pas d'autre concerto pour violon où le compositeur utilise le mot dolce si souvent. Pour moi, c'est le concerto pour violon le plus doux, le plus tendre, qu'on puisse imaginer. Et quand je suis sur scène pour le jouer, je suis constamment frappé par son incroyable pureté. Je crois que c'est la pureté qui m'attire spécialement dans cette musique. De l'autre côté, il y a le perfectionnisme de l'écriture de Brahms, son génie infini dans le développement d'une mélodie. Chaque nuance de cette œuvre est intégrée à une architecture parfaitement équilibrée et incroyablement belle. Vous parlez avec lyrisme d'une œuvre qui avait autrefois mauvaise réputation auprès des violonistes - accusée d'être trop difficile, d'avoir trop peu de mélodies et trop de passages importants pour d'autres instruments. Les critiques étaient telles que Brahms détruisit les esquisses d'un deuxième concerto pour violon. L'ampleur de ces critiques ne veut pas dire qu'elles sont justifiés pour autant. Prenez le début de la partie de violon: pour moi, le violon introduit ici très clairement l'idée principale de tout le concerto. Il suffit de le reconnaître, le gigantesque tableau affectif qui est peint ici - cette ferveur. Et il ne faut pas oublier le rôle immense joué par Joseph Joachim dans la conception de ce concerto . . .
. . . le grand violoniste à qui Brahms dédia son Concerto pour violon. Je crois que Joachim est encore sous-estimé. Il a considérablement influencé Brahms et l'a encouragé à rompre avec les règles existantes. Il n'était pas seulement un merveilleux violoniste, mais un musicien très cultivé. Je crois que c'est grâce à lui que ce concerto a redéfini les formes compositionnelles, qu'il est allé au-delà de tout ce qui précédait. Ce qui m'impressionne le plus, cependant, est la créativité contenue dans cette musique, si logique et si invulnérable. Le Concerto pour violon tout entier est pour moi une grande pierre, d'une beauté merveilleuse, qui ne menace jamais de s'effondrer à aucun endroit - c'est en ce sens une composition à la fois pleine de tendresse et monumentale. Il a longtemps été considéré comme injouable. Avez-vous jamais eu peur d'échouer dans une œuvre musicale? Le Concerto pour piano de Tchaïkovski était lui aussi considéré autrefois comme injouable - ce sont des mots qui pour moi ne veulent pas dire grand-chose. Il faut bien entendu accorder à l'œuvre le respect qu'elle mérite, mais je ne peux pas dire qu'aucune de ces pièces me fasse peur. Elles sont simplement trop belles pour cela, et le travail de toute une vie qu'on peut leur consacrer est trop gratifiant. Pour répondre à votre question: non, je n'ai pas peur, plutôt le contraire - une incroyable envie de me plonger dans l'œuvre. Le Concerto pour violon de Brahms est maintenant un classique du répertoire violonistique. Votre enregistrement doit rivaliser avec beaucoup d'autres. Je suis frappé par le fait qu'il se distingue de nombreux enregistrements par son incroyable naturel. Vous semblez renoncer dans votre interprétation à toute trace d'intellectualisme . . .
C'est peut-être parce que très souvent le cœur est un meilleur guide! Cette partition brillante n'appelle pas une interprétation aussi compliquée qu'on le suppose parfois. Elle parle pour l'essentiel d'elle-même. Le naturel de l'exécution est pour moi la plus haute forme d'intellectualisme. Les indications dolce sont la clef de l'ensemble de l'œuvre - il suffit d'écouter les dialogues avec l'orchestre et on entend la poésie, le discours, le désir et la nostalgie qui se déploient. La composition de Brahms communique sur plusieurs plans, à de nombreux niveaux - vous donnez à tout cela une allure très compacte. Je suis heureux de vous l'entendre dire. Le chef, Riccardo Chailly, et moi-même avons en fait compris pendant les répétitions qu'il ne faut pas présenter ce concerto comme un morceau de bravoure pour le violon. Il n'y a pas d'autre choix que de l'interpréter symphoniquement. Ce sont de merveilleux dialogues et duos, une somptueuse interaction entre violon solo et orchestre, mais aussi entre les autres instruments individuels. Sur ce nouvel album figure également le Double Concerto . . .
. . . auquel s'appliquent les mêmes principes: interaction musicale. De même que le chef et l'orchestre sont des partenaires cruciaux pour l'interprétation dans le Concerto pour violon, de même le violoncelliste est essentiel pour le violoniste dans le Double Concerto. En Truls Mørk j'ai trouvé une âme sœur. Je crois que nous avions tous deux le sentiment en répétition et en concert que nos idées et nos vues étaient parfaitement en harmonie dans la musique de Brahms.